Click here for the Facebook Event. 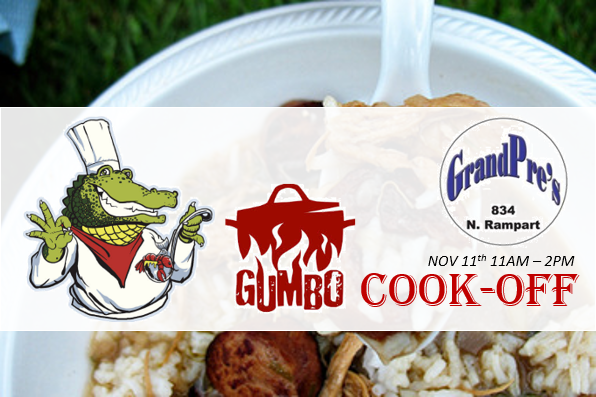 Join us for the Gumbo Cookoff at Grand Pre’s as the Saints take on the Bengals. The event is a $10 donation to the Krewe which includes tasting delicious gumbo from the entrants. You’ll cast your vote and we’ll announce the winners toward the end of the event. To enter the Gumbo Contest email KreweofAmonRa@outlook.com with your name and best way to contact you. The entry fee is $25. We will provide the rice, bowls, spoons, and French bread. Please bring your gumbo heated or in a crockpot to heat it up. Gumbo Cookoff PRIZES: 1st prize – $100 2nd prize – $75 3rd prize – $50 Click here for tickets on Eventbrite.